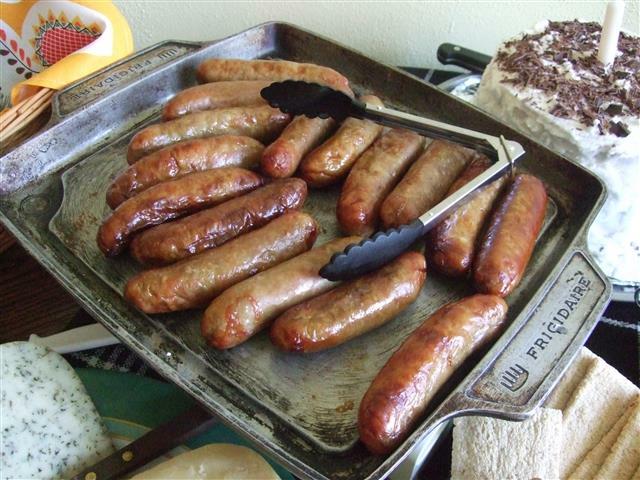 IF It Doesn’t Go Well … Eat The Evidence !!! 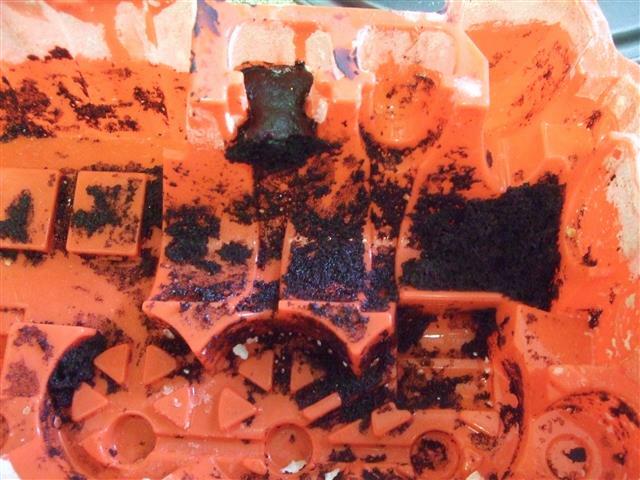 Last year I discovered a silicone baking form that was in the shape of a train. 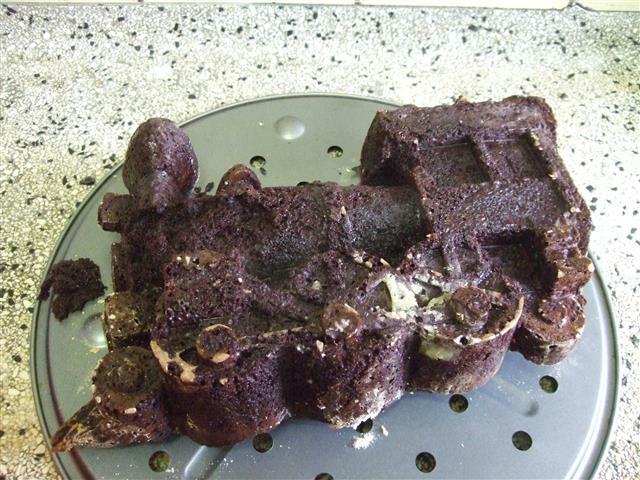 One of our friends has a son who is seriously, wild & categorically addicted to anything that resembles his hero: Thomas the train, and I knew that a train birthday cake would probably be very well received. 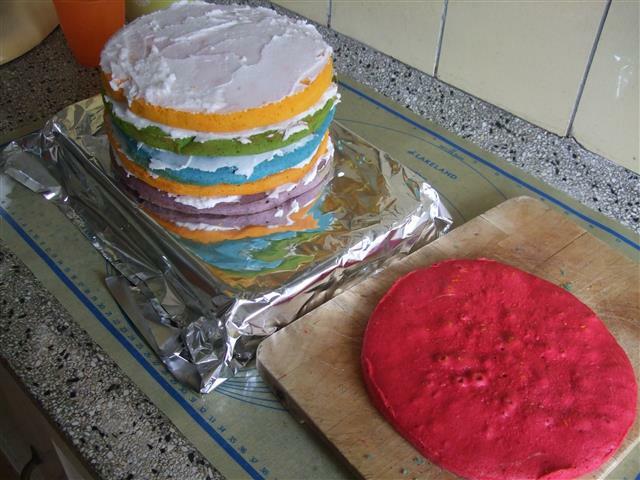 Since neither me for my friend has ever used silicone much before in cooking, we thought it would be wise to have a test run before the day so that we could see if the cake for really worked or not. I’m a hopeless cake baker so stuck to my favourite cake mixture: “Lynn’s Lucious Chocolate Cake, step-by-step idiot proof cake“! Thinking that a single batch of the recipe would do just fine, I copy this idea and poured the cake mixture into the pan. 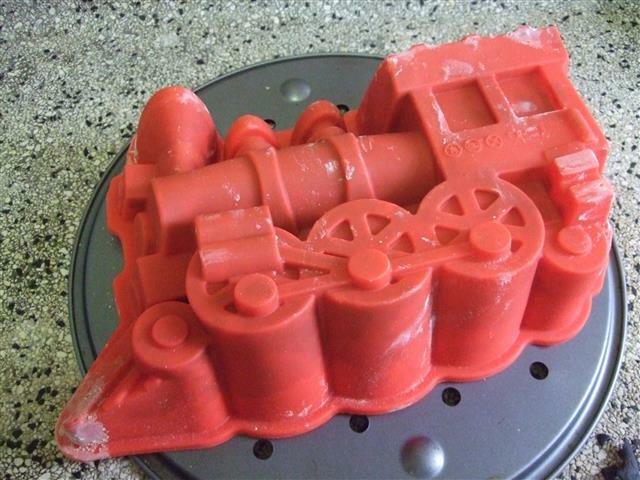 Once the cake was in the oven, it was really clear that one lot of batter would not be enough. 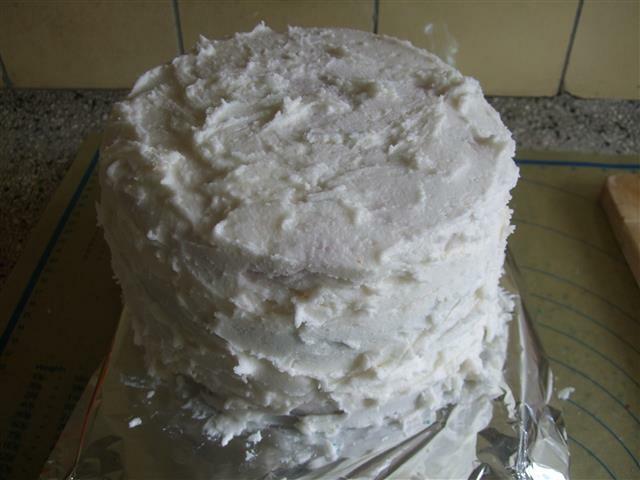 My friend had used melter butter on the inside of the form so the cake came out it rather well. The cake form is not evenly filled throughout , and it’s a bit wobbly , but my cake is cooked and now is the moment of triumph or disaster: will the cake release easily as the manufacturing sales tell us it should. The cake left the form remarkably easily and it was “kind of” a success. 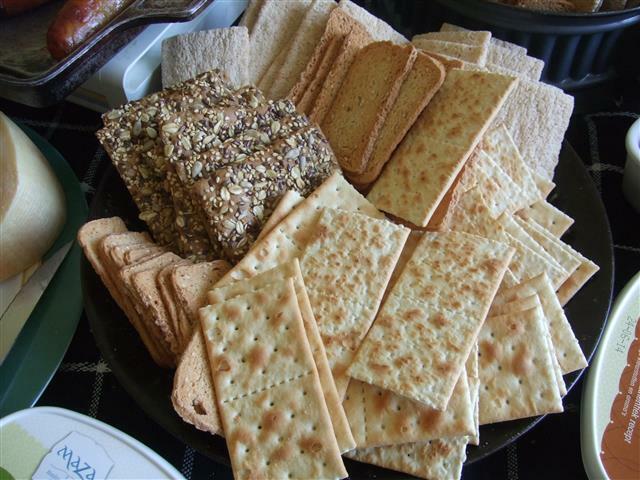 It didn’t take Family Kiwidutch and friends long to eat the evidence…All we need to do now is to try again! 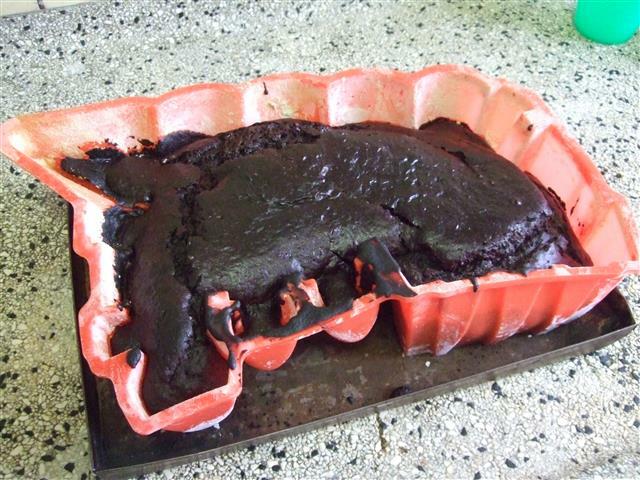 Lynn’s Luscious Chocolate Cake, step-by-step idiot-proof cake ! 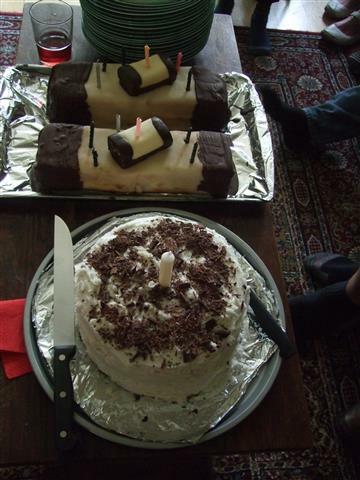 Yesterday I posted photographs about the surprise birthday cakes I made for Kiwi Daughter’s birthday. 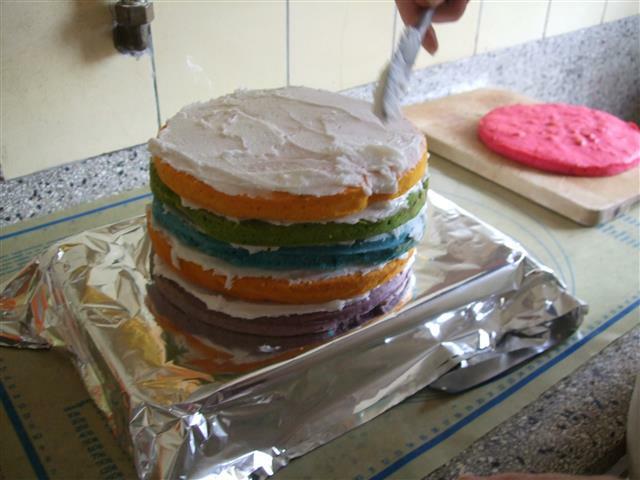 Today’s post is about the cake she wanted to make as a surprise for all of our guests. 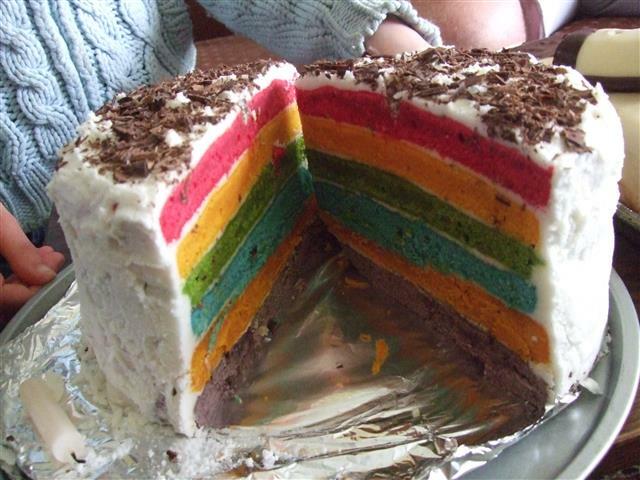 She had seen a rainbow cake on the internet and wanted desperately to make it. 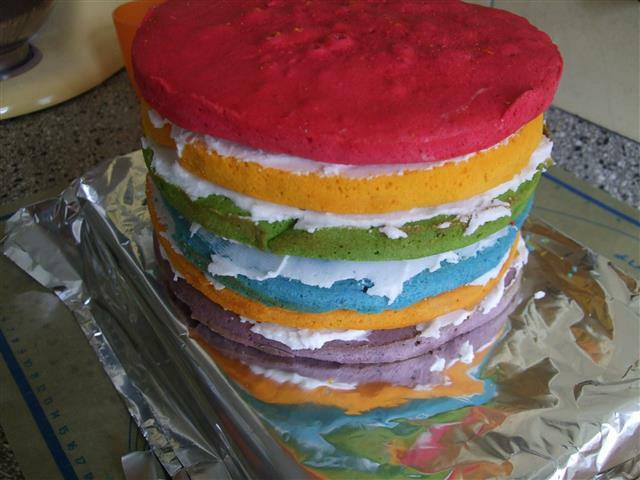 To be slightly more accurate she wanted me to make it, but the recipe involved three batches of cake batter, each batch was to be then divided in half and each half made into a different colour. 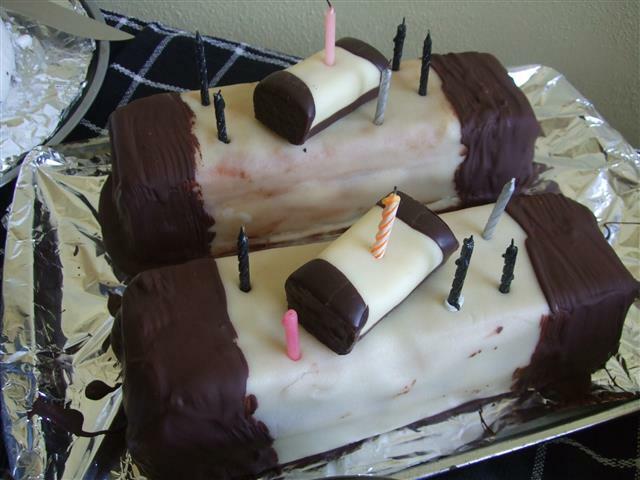 I’m not the world’s best cake baker and on a more practical level I knew I couldn’t stand on my bad foot long enough to do this on my own so a small battle of wills ensued. Once it had been made clear to Kiwi Daughter that this cake was only going to get made if she did most of the work, we organised ourselves whereby I did most of the work that involved sitting down. I greased and then lined the cake tins with baking parchment, made sure the oven settings were in order and organised the ingredients we needed. Kiwi Daughter was in charge of mixing each batch of cake batter, and I split them and helped with the colouring. She did the rest and after a while we had six round cakes cooling on the dining room table. The recipe called for soft brown sugar and this made mixing a bright yellow coloured cake difficult: no matter how much yellow colouring I added it was more orange than yellow. For the final batch of ingredients I substituted white sugar for the brown that the recipe called for and the yellow turned out a little better, but nowhere as bright as the one on the website. We didn’t mind, we just arranged the colours in the order we thought looked best. 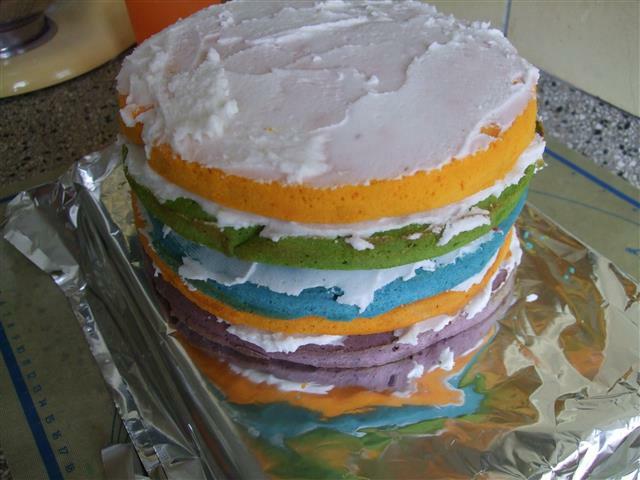 I put a thin layer of vanilla icing between each layer of cake and then put the rest of the icing around the sides, hopefully hiding the coloured layers so that it would remain a surprise until the cake was cut. 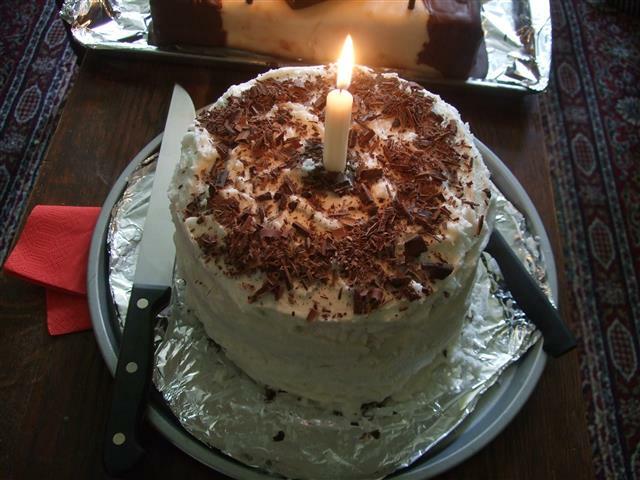 The next day I used a potato peeler to shave some chocolate from a chocolate bar on the top as final decoration. 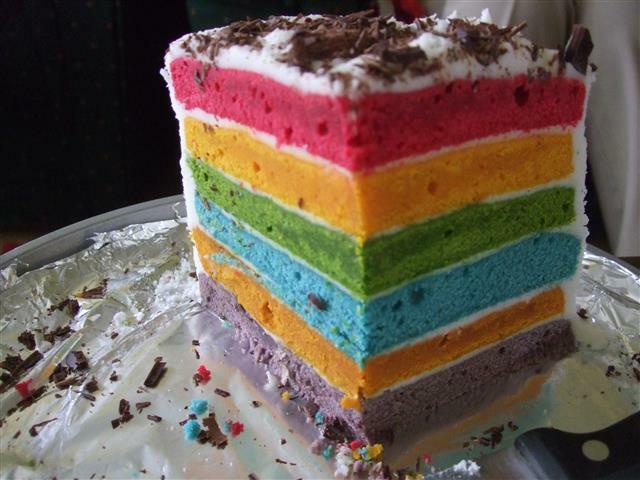 It was therefore a grand surprise all round: Kiwi Daughter didn’t know about the other (Mergpijp) cakes I’d made, so got a surprise of her own, and she surprised our guests and even Little Mr with her rainbow cake once it was cut and the colours were revealed. 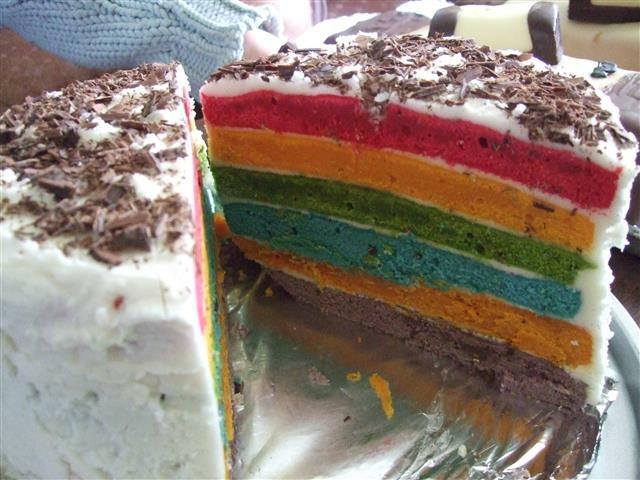 There were squeals of delight and ohh’s and aaahs all round and I had to cut the rainbow cake into ultra thin slices because so many people wanted a piece. Since it was a tall cake that wasn’t a problem, and it gave everyone a little taste before they came back for a slice of the Mergpijp cakes. The buffet table was also a success: Himself and the kids helped set up the room, two friends came early and helped with preparation. 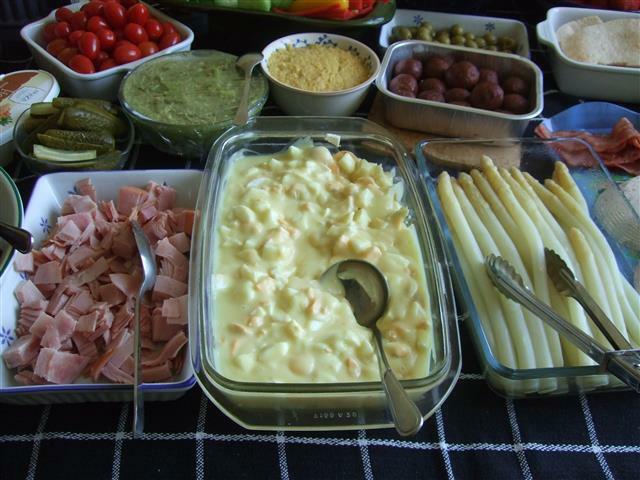 I cooked a big tray of sausages in the oven, Himself boiled fresh white asparagus and we used a packet mix of asparagus sauce with a heap of hard boiled eggs, served in Dutch tradition with pieces of ham. In this case I didn’t serve them together because one guest has an egg allergy, some vegetarians in the family and some who don’t eat pork. 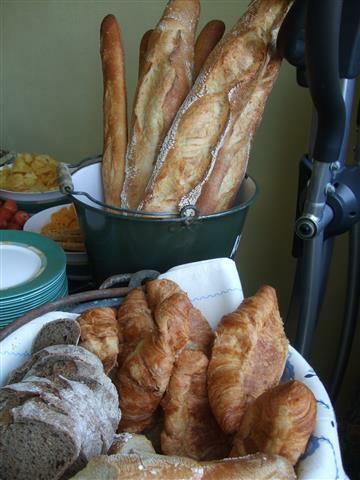 They were laid out side by side so that guests could pick whatever they wanted. 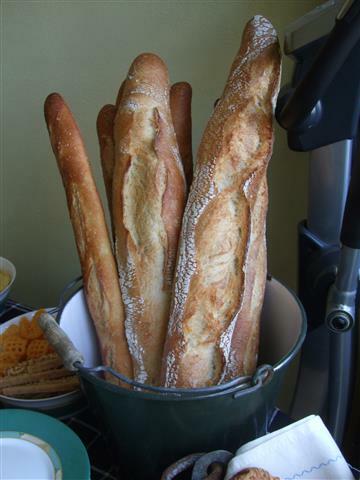 For the rest we served fresh bread from a specialist French bakery (the best in the Hague in my opinion) and a selection of cold meats and cheeses. 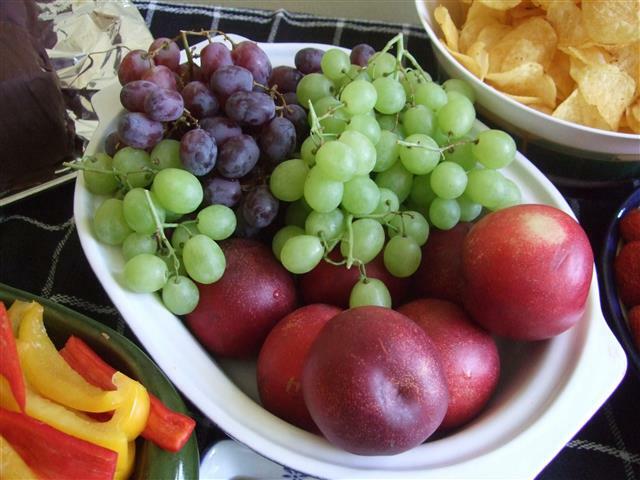 The rest of the table was easy to prepare: fresh fruit and vegetables, crackers etc. No multiple hot dishes this time. 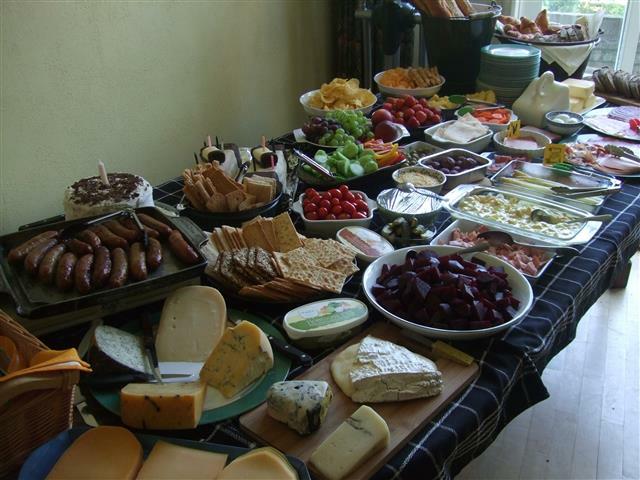 It’s an easy buffet and something for everyone without the need for lots of things like potato crisps (we had one bowl) or junk food. 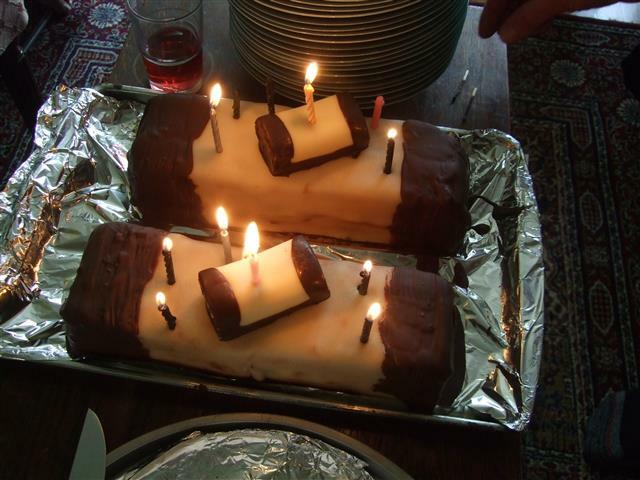 Giant Mergpijp Cakes, A Birthday Surprise for Kiwi Daughter! As happens more often in families, even in a family of four, we have a cluster of Birthday’s all huddled together in one month. In fact if it had been up to the Doctors, Kiwi Daughter would actually have been born on Himself’s birthday but I asked to be induced earlier so that she would have her very own special day. When they found out later, some in the family thought this was a rather strange but as a twin I have never had a birth date to myself and just wanted to keep things separate. Kiwi Daughter became the best Birthday present Himself has ever had, with some twelve hours separating their birth dates. My birthday is later in the same month and we either do big parties in the first and last weeks of the month and or we choose a date in a middle and celebrate the three of us together. 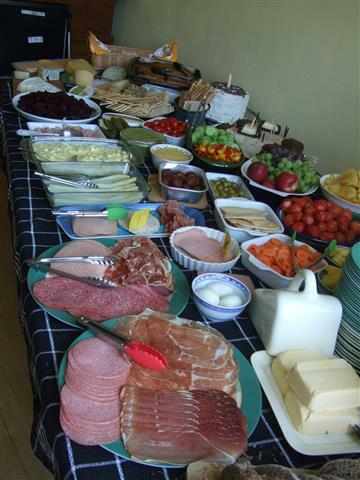 This year we chose the later and in the middle of the month we planned a big buffet lunch for family and friends. 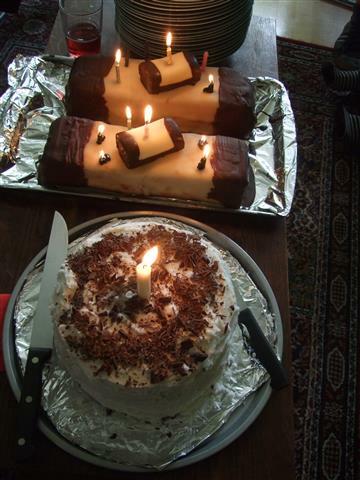 Kiwi Daughter has a favourite sweet treat: Dutch mergpijp , a little cake with a strip of cream and jam in the centre, wrapped entirely in marzipan, the underside coated in chocolate and each end dipped in chocolate too. 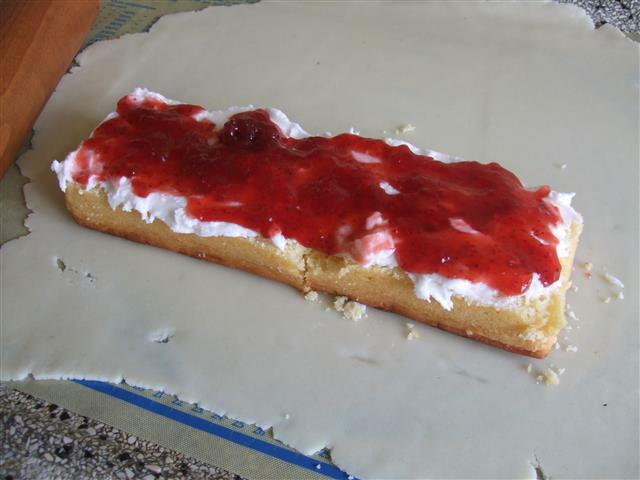 Mergpijp are very cheap supermarket cakes, sweet, not too creamy as some Dutch cakes are want to be, and rather tasty even though the quality might be a bit suspect. Kiwi Daughter would demolish packet of mergpijpen every day if she could. (Dream on kid!). 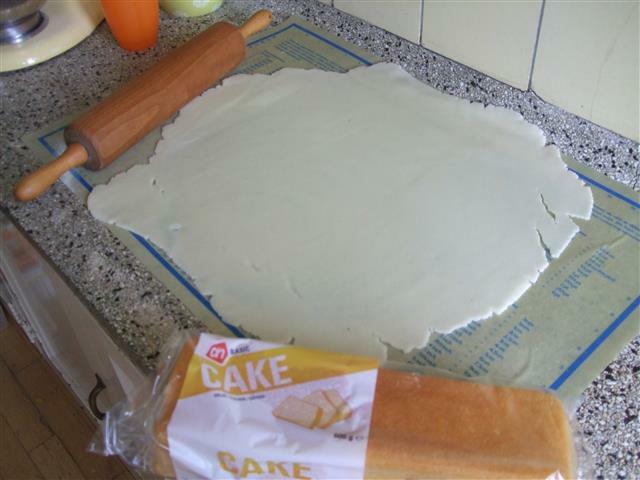 I had been looking on the internet for simple cake ideas and came across a photograph of a giant sized mergpijp cake. It was perfect: both easy to make and sure to be a certain hit with Kiwi Daughter. My foot has been very sore of late so standing in the kitchen for any length of time was out of the question. 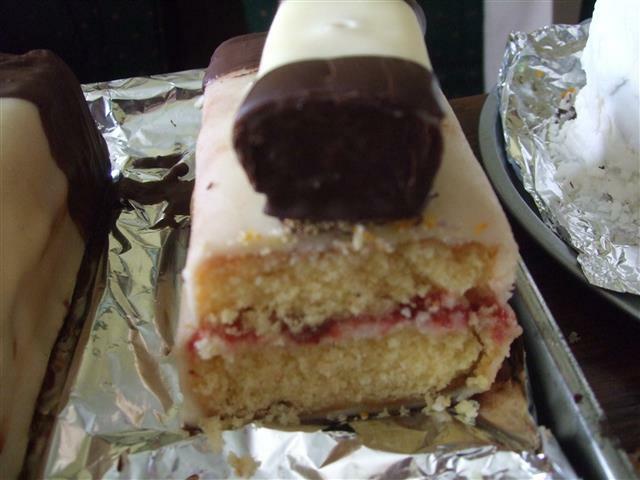 Short-cuts were needed, and came in the form of a shop-bought vanilla flavoured cake, supermarket jam and two blocks of ready made marzipan. Then I cut the cake in half (I accidently broke it but managed to repair some of the damage when I iced and placed jam in the middle). 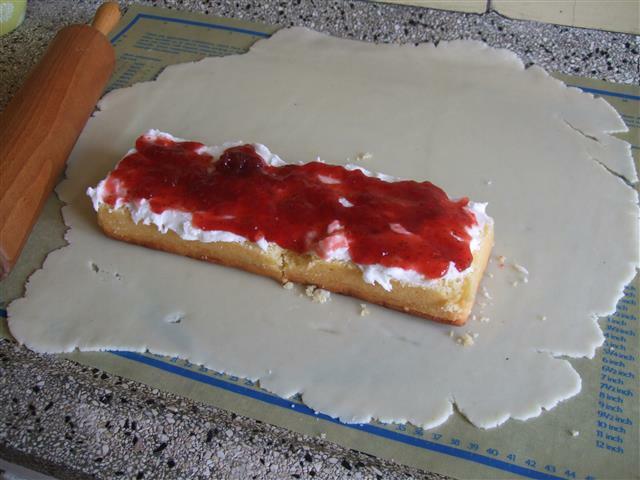 I spread a thin layer of vanilla icing on first and then topped that with strawberry jam, finishing it off by replacing to top of the cake back on top. 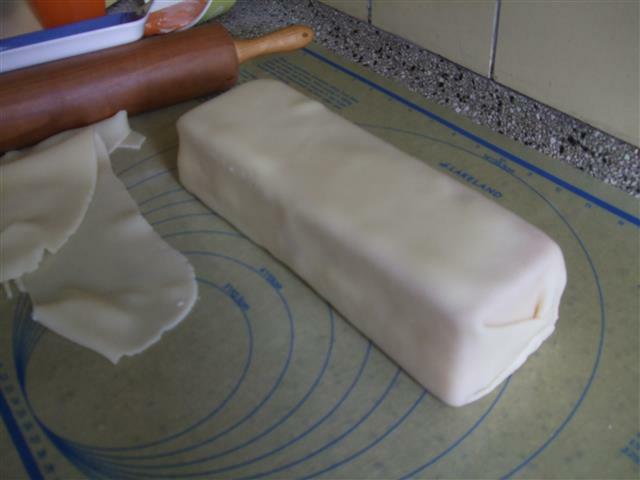 My next step was to carefully fold the rolled marzipan around the entire cake, packaging it up like a wrapped parcel. Because I was in pain from standing by now, I decided to to the chocolate dipping part of the assembly the next morning, so put the cake at this stage in the fridge. 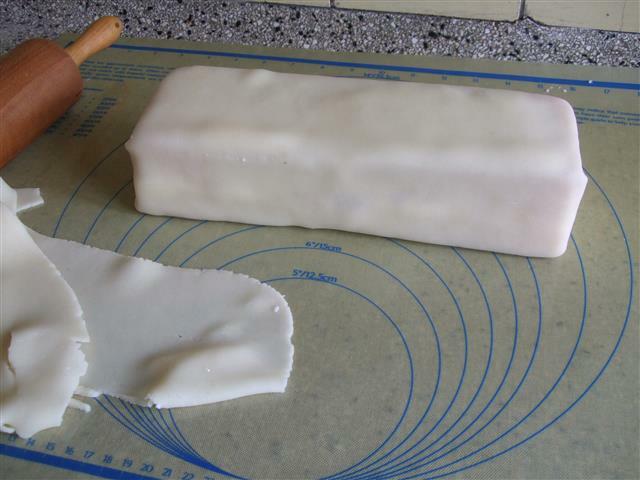 This turned out to not be a great idea: when I got it out the next morning it was damp, very soft and sticky, I left it out on the table for as long as I could and it did dry out a bit, but I know for next time that when working with marzipan, don’t refrigerate it. The next morning I had two friends come and help with the Birthday buffet, one helped me with the cake, first I coated the bottom completely with a layer of chocolate, just as the shop bought ones are, then we painted each end in chocolate, with would have been easier if the marzipan hadn’t been so soft and the cake in danger of breaking in half at any moment. Luckily I could hold it gently whilst one of my friends did the chocolate painting on the ends and with just a few sticky chocolate smudges we got it done. 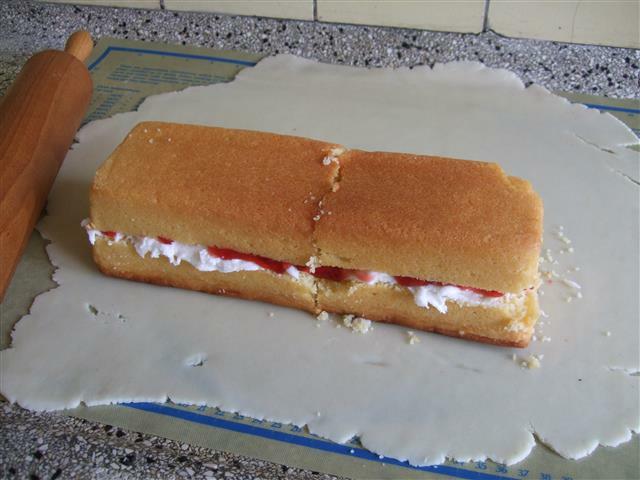 I’m sure this part would have gone easier had the marzipan not been so soft and damp but what’s amateur cake making without a leaning curve? I make two of these cakes and placed a small regular sized shop bought mergpijp on top of each of them (just in case the guests didn’t guess what the cake was meant to be). Kiwi Daughter didn’t need any hints when they were bought out, she squealed with delight and declared both of them ” all hers!”.